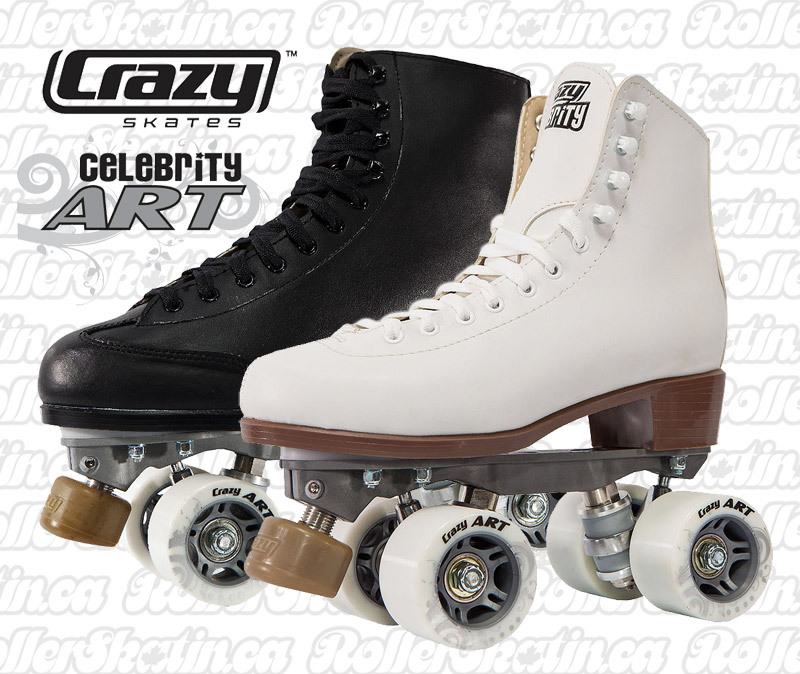 The CRAZY Celebrity Art retains the traditional classic 'Retro' design and styling of the high-top roller skate but has been modernized with the latest technologies to perform like a championship skate outfit at a very competitive price! The soft interior and sturdy exterior Leatherette of the boot offers more support than a low-cut boot. The Celebrity Art boot features CRAZY's signature open toe box that 'closes in' or 'widens' accommodating narrow and wide fitting feet - simply loosen and tighten the laces for the perfect fit - this is an exclusive design feature from CRAZY Skates. Performance comes from the fiber Nylon APOLLO plate - lightweight, strong and rigid, transferring power through the plate to the floor! the APOLLO plate is very responsive and offers smooth, fluid action with reverse kingpin so action adjustments are easy via a single nyloc nut and skatetool. Power Wedges are standard on the Celebrity Art - a wedge of lightweight nylon plastic that takes up the void between the front of the boot and front of plate. This allows a more efficient level of power transfer from the toes down to the wheels or stopper. The Celebrity Art roller skate comes complete with Non-Marking CRAZY Li'l Bloc 5/8" adjustable stoppers, narrow profile 57mm x 32mm Urethane Signature Art wheels (can be used indoors or outdoors) with ABEC 3 bearings. Choose White or Black boot with size availability shown in the pull-down menu. NOTE: The measurements indicated on the right are the length of the actual insole, your foot should measure approx. 4mm less than the insole. INSTOCK DOMINION Classic Leather Rink Roller Skates (671 and 274) - Last Ones Made in Canada!